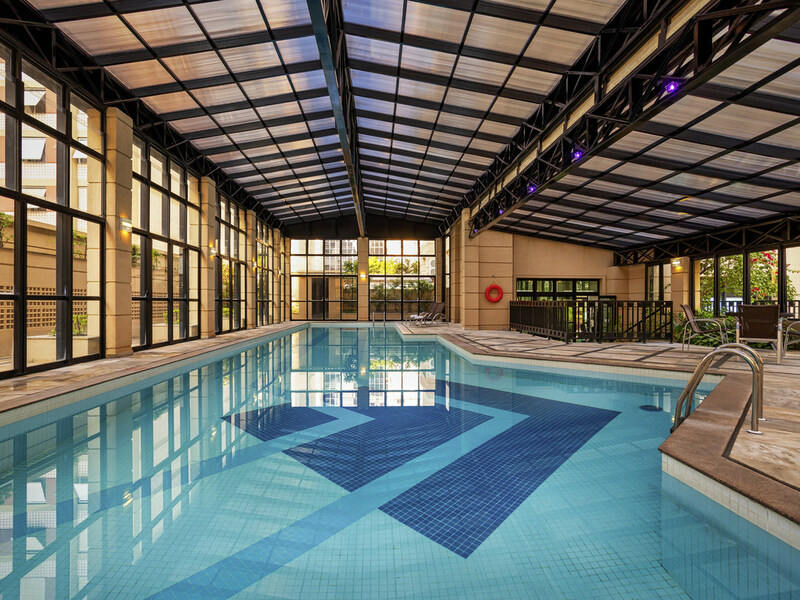 The Mercure São Paulo Pinheiros hotel is located just a block away from the shops and restaurants of the famous Rua Oscar Freire, close to the Rebouças Convention Center and Allianz Parque stadium and just 6.2 miles (10 km) from Congonhas Airport. With a charming classic touch, the hotel offers comfortable and practical rooms equipped with air conditioning and free WIFI. There is also a heated pool, sauna, fitness center and delightful Italian restaurant for a truly comfortable stay. Enjoy our location close to São Paulo's Hospital das Clínicas, the Instituto Tomie Ohtake and the city's main attractions, such as the designer shops and traditional restaurants on Rua Oscar Freire and the bustling Avenida Paulista and Vila Madalena Stroll to Praça Benedito Calixto with its traditional antiques fair on Saturdays, or Beco de Batman, the famous open-air graffiti gallery in Vila Madalena, both close to the hotel. São Paulo offers all the attractions of a major city: a variety of restaurants, bars, nightclubs, theaters, cinemas, museums and parks. Easy access to the Iguatemi and Eldorado shopping centers. Special wedding package offers to guarantee an unforgettable day! Just ask! Apartments fitted with 32" LCD TV, 2-seater sofa, desk, minibar, microwave, safe, central A/C, WIFI, cooking utensils, hairdryer and shaving mirror in the bathroom. The La Terrina restaurant invites you to experience the flavors of classic Italian cooking. With welcoming decor reminiscent of traditional Italian villages, the menu offers fresh pasta dishes to delight your taste buds! It was a very basic experience for a Mercure Hotel. It was good but there should be some arrangements for currency exchange. We had a bad experience regarding this. We could not exchange money from airport, hotel was not providing us any solution to it and the nearest currency exchange companies were closed. A good stay in a clean and quiet room. Breakfast is OK with all basic offers for a hotel in this category. The hotel entrance though is rather messy. There are some people staying around at the front door that seem to belong to staff and/or the parking lot, but they do not communicate with the staff in the check in/out counter. A propos the staff in the main counter could be more effective, since guests checking in/out are usually in a hurry so they expect a more swift service. To be honest it was a bit underwhelming. The staff was great and really tried but for an international chain I would expect that they would have more than one staff who spoke English. For someone like me who pretty much came from the other side of the world even ordering room service was quite a frustrating experience. The rooms too were a bit run down and needs a make over. very good! But the bed is small! All was fine Except that -- the faucets on the sink and the shower are worn down, and there are sharp edges that I cut my fingers on (Room #2607). My family and I had a very nice time on the hotel. I went for a course on the hotel, and my wife and my younger daughter, came together. The classroom, is fine, but it could be better on the chairs. It's unconfortable when you take a long time sat there. Othewise, the experience on the hotel was pleasent and satisfied. The staff at the hotel were friendly and attentive and they are the true asset of the hotel. The hotel location is also a p,us. The rooms and facilities require updating and more care to detail. The restaurant manager was extremely kind every time I had breakfast and the hostess was very welcoming. At the front desk the customer service was outstanding. There were several light breakdowns but managed correctly. We had a great experience with the hotel: shower good, bedroom small but ok, living room very good and excellent breakfast excellent. The only minus was the noise of the aircondition in the bathroom and also very annoying in the living room. I do not know if this is a problem of our room or all unites are like that. The Accor Mercure São Paulo Pinheiros hotel is located only a 2-block walk from the school I attended for a week, Fast Forward Portuguese language school. The accommodation I stayed in was actually a suite, with a living room with LED TV, office area with desk, high speed Internet, bar fridge, microwave, and a separate bedroom with queen size bed. This arrangement worked well for me for completing my school's daily homework assignment. A buffet breakfast each morning in the hotel's garden court restaurant was included. I enjoyed a nice view of São Paulo too, from my 17th floor window! The location was good.All the receptionist were very nice and humble. The stay was pretty nice ,except two/three incident a) the room was not ready even by 7 pm after my returning from work, then i have to ask at reception about the same.however, it was done very quickly. No complains b) No electricity throughout the Friday night :-(. Bit sad as it was my last night . c) The breakfast is very simple. Can add more menu. Service personnel was friendly and open, room was mainly tidy and clean, mattress was good and hard, mini-kitchen, turnable TV are really nice add-ons to a hotel room. Bar personnel and restaurant/breakfast rooms have room for improvement.